Vancouver, B.C. 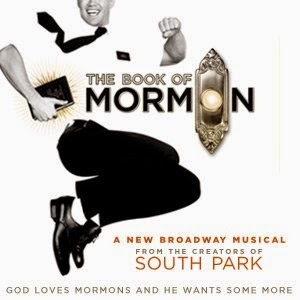 – THE BOOK OF MORMON, winner of nine Tony Awards including Best Musical, is pleased to announce a lottery ticket policy for the National Tour, which begins April 7 at the Queen Elizabeth Theatre in Vancouver, B.C., and plays a limited one-week engagement through April 12 . In Vancouver, the production will conduct a pre-show lottery, making a limited number of tickets available at $25 each. Entries for the lottery will be accepted 2 hours and 30 minutes prior to each performance, with the winners drawn 2 hours before the curtain rises. The lottery will be held on the Queen Elizabeth Theatre Plaza, located around the corner from the box office. Entries will be accepted at the Queen Elizabeth Theatre Plaza beginning two and a half hours prior to each performance; each person will print their name and the number of tickets (1 or 2) they wish to purchase on a card that is provided. Two hours before curtain, names will be drawn at random for a limited number of tickets priced at $25 each, cash only. Only one entry is allowed per person. Cards are checked for duplication prior to drawing. Winners must be present at the time of the drawing and show valid ID to purchase tickets. Limit one entry per person and two tickets per winner. Tickets are subject to availability. BROADWAY ACROSS CANADA™ and Broadway Across America® is part of the Key Brand Entertainment family of companies which includes Broadway.com and is operated by John Gore (Owner & CEO). BAA is the foremost presenter of first-class touring musicals and plays in North America, operating in 40 markets. As a leading Broadway producer, BAA is dedicated to the development and production of new and diverse theatre. Current/upcoming productions include Beautiful, Betrayal, Bullets Over Broadway, Little Miss Sunshine, Million Dollar Quartet and Pippin. Past productions include Hairspray, How to Succeed in Business Without Really Trying, Memphis,Promises, Promises, The Producers and War Horse. Broadway.com is the premier theater website for news, exclusive content and ticket sales. For more information please visit BroadwayAcrossCanada.ca and Broadway.com. I want to see the booth with La Grotta Del Formaggio.